How did the Romans shape our world? What was life like for the average Roman? Find out in Eyewitness Ancient Rome and discover all about Romans and their civilization. From powerful senators and emperors to the Romans' ancient Gods you'll have a spectacular view into one of history's most fascinating civilizations. 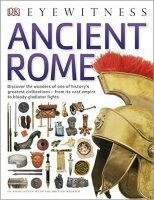 Eyewitness reference books are now more interactive and colourful, with new infographics, statistics, facts and timelines, plus a giant pull-out wall chart, you'll be an expert on Ancient Rome in no time. Great for projects or just for fun, learn everything you need to know about the Romans with Eyewitness.